Once at home on the coffee table or nestled behind the boiled sweets in the glove compartment, Kleenex has finally abandoned its masculine image and infiltrated the ‘girly stuff’ shelf of the bathroom cabinet. Kleenex, the UK’s number 1 tissue brand, has embarked on a great autumn migration. This new range of facial cleansing products includes Eye Make-Up Removal Wipes, Facial Cloths, Facial Cleansing Wipes and Shine-Absorbing Sheets, all promising to be environmentally friendly and ‘extra gentle’ on the skin (because girls are made of fairy dust). It may seem strange to get excited about a wet wipe, but Kleenex’s Facial Cleansing Wipes add a level of sophistication that other brands seem to miss. Softer even than Johnson’s baby wipes, and without the slightly sickly smell you can’t help but associate with baby poo, these wipes leave the skin clear, make-up free and with a sort of clinical tingling sensation. This is the facial wipe for the grown-up, modern woman- and the perfect size for slipping neatly onto the cosmetics shelf. A nice added feature is the informative packaging. Each ingredient has a little explanation in purple writing, such as: “Phenoxyethanol (helps keep wipes fresh)”. So all the terrifying names that make you wonder if you could be rubbing something highly cancerous into your skin, suddenly become a lot more comforting- like the Kleenex brand itself. The Shine Absorbing Sheets come in a nice compact casing that looks a little like a chewing gum packet. This helps disguise that fact that you’re carrying around a product that essentially absorbs face grease (not very elegant). The sheets work as a form of blotting paper that you can dab on your skin without removing your makeup, making it a great touch-up for during the day. The packet offers a generous number of sheets that should last a fair few weeks, depending on your general level of sweatiness. It’s also the perfect size and shape to slip into your handbag for a sophisticated evening out. Discrete, feminine and modern- it’s safe to say that Kleenex’s new range for facial care will soon be a common sight in the handbags and bathroom cabinets of women who care about their skin. 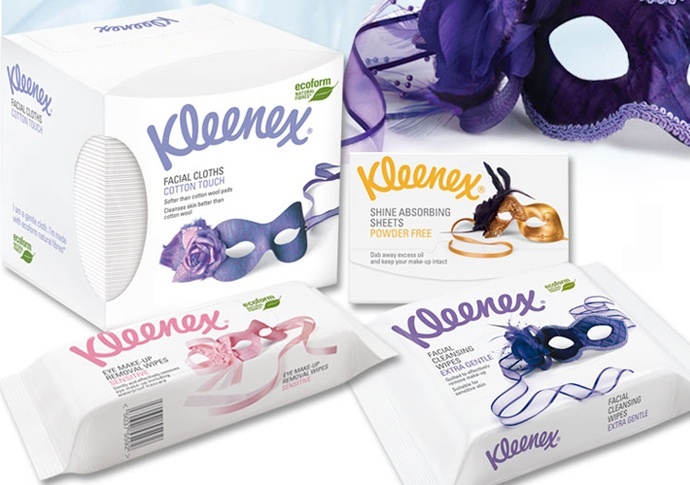 For more information about the Kleenex beauty range, and for stockists, please visit the official Kleenex website.